Crucial to ending South African apartheid, divestment through grassroots economic pressure has proven itself a powerful tactic for standing against injustice. For this reason, Columbia Students for Justice in Palestine and Jewish Voice for Peace launched Columbia University Apartheid Divest in 2016 and are now urging Barnard students to vote “Yes” on the current referendum on the Student Government Association elections ballot to divest the college’s endowment from eight multinational companies that directly profit from violations of Palestinian human rights. From the historic divestment from the South African Apartheid State in 1985 to the recent divestment from climate change-denying companies, we as Barnard students have demonstrated our commitment to ending Barnard’s institutional complicity in global systems of oppression, and it is this legacy that we take up once again. The Boycott, Divestment, and Sanctions (BDS) movement initiated by Palestinian civil society over a decade ago takes its inspiration from the anti-apartheid struggle in South Africa—with the support of that movement’s leaders—and calls for individuals, institutions, and governments to remove themselves both economically and symbolically from the Israeli State until it abides by international law by ending the occupation, decolonizing all occupied Arab lands, and dismantling the Apartheid Wall; recognizing the equal rights of all civilians living in Israel; and respecting, protecting, and promoting the Right of Return for all Palestinian refugees as stipulated in UN Resolution 194. Israeli practices and policies combine apartheid, military occupation, and colonization to dispossess its indigenous Palestinian presence. This system of control and oppression is sustained through Israel’s contracts with multinational corporations. The eight companies we target for divestment provide the Israeli government and military with a wide range of services that entrench this system of Palestinian dispossession. Hyundai Heavy Industries and Caterpillar supplies the army with construction equipment used to violate international law by demolishing Palestinian homes, building the internationally-condemned Apartheid Wall, and erecting illegal settlements in the West Bank. Bank Hapoalim finances the construction of such settlements and engages in banking discrimination against Palestinian citizens of Israel. Hewlett Packard (HP), best known for its printers and laptops, manufactures biometric ID cards for citizens and non-citizen “residents” of Israel, which enforce a segregated identity card system. HP also maintains the information system of the Israeli Prison Service, in which Palestinian political prisoners—including hundreds of minors—are subjected to torture and discriminatory treatment after their processing in the military court system. War-profiteering companies like Lockheed Martin, Boeing, and Elbit Systems provide the Israeli army with heavy munitions used to commit a range of well-documented crimes against humanity in the Gaza Strip, including chemical warfare and the indiscriminate targeting of civilians. The Israeli national water company Mekorot practices water apartheid in the West Bank, providing water connections to illegal settlements and outposts while simultaneously expropriating Palestinian water resources. The company also denies water access to “unrecognized” Bedouin villages in the southern region of Israel and is partnered with the Jewish National Fund’s “Blueprint Negev” forced displacement project. Taken all together, these eight companies subcontract the violence enacted against Palestinians living under the heel of Israeli control. These practices directly violate the UN Human Rights Norms for Business, which require “businesses to exercise due diligence regarding the source or potential uses of goods or services, and in some instances to forego business opportunities in order to avoid complicity in, or encouragement of, human rights violations.” The reasons for divesting Barnard’s endowment from such companies are clear: Divestment is part and parcel of an overall commitment to justice, a commitment consistent with opposition to human rights abuses anywhere in the world. Divestment is the moral answer to the question of Palestine—a question now entering its 70th year since the ethnic cleansing of 750,000 Palestinians in the period prefacing the establishment of Israel. 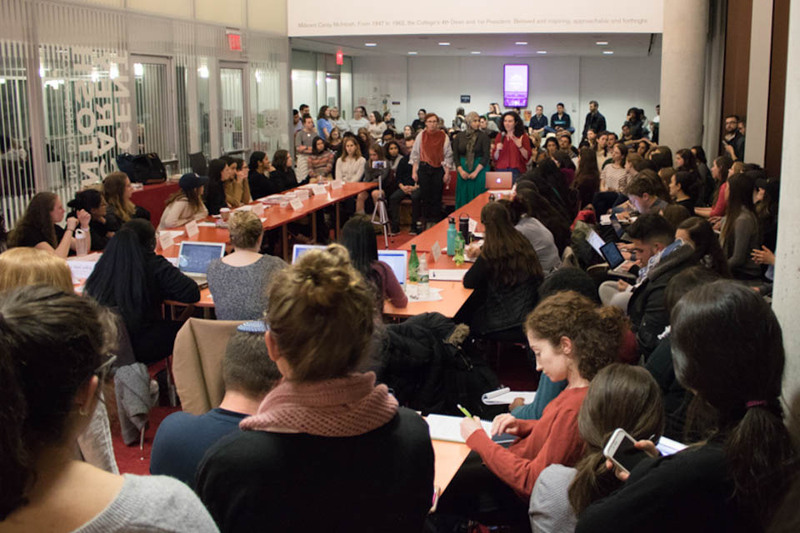 The task of creating a socially-conscious college falls to the students who give their campus form and life during their time at Barnard. Divestment, if we understand it from the standpoint of the oppressed, represents the first step in the path towards justice. Yes, divestment at Barnard is a divisive issue, and yes, BDS at Barnard makes people uncomfortable. Every confrontation with oppression is divisive; but it’s at the exact moment of confrontation that the space for collective action emerges, because it presents a direct challenge to silence and complicity. As a liberal arts college, Barnard aims to create a space where its students can grow intellectually and be empowered to make crucial personal and moral decisions; it should be up to students to decide whether their moral compass is reflected by Barnard’s tuition-funded investments in companies like these. It is divisive precisely because it poses a simple—and yes, it is that simple—question: if you stand against injustice, will you stand with Palestine? Columbia University Apartheid Divest is a coalition between Students for Justice in Palestine and Jewish Voice for Peace. The SGA voting period runs from April 11th to April 18th at noon on the MyBarnard web portal. Seniors and students studying abroad are eligible to vote.